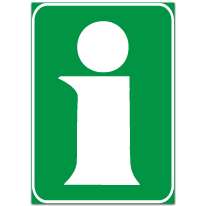 Purpose: To give more information about the main message on regulatory, warning or diagrammatical guidance signs. Action: Pay attention to these signs in order to realise what the danger is, what a safe speed is, how far away the danger is and the distance the danger will continue. Where: Next to the entrance of a parking area or in the top right-hand or top left-hand corner of a notice board. Purpose: To inform you of the existence of an information office or notice board. Action: You can obtain information about the area at this sign.